Sexual harassment at work is illegal and all over the news, but it just keeps happening. In 2017 the EEOC received over 12,000 sexual harassment complaints. Only 1/3 of these were found to be without merit which means 2/3 of them had merit. 22% of these sexual harassment lawsuits were resolved on the merits. 662 settled for a total value of more than $46 million giving an average value of slightly less than $70,000 for each of these sexual harassment cases. On the California state level, the Department of Fair Employment and Housing (DFEH) received 554 complaints of sexual harassment in 2016. Out of all of the complaints the DFEH received for employment discrimination they only filed 14 civil complaints. None of these complaints were for sexual harassment. Overall, 71% of the total complaints filed at the DFEH for employment were filed by lawyers asking for immediate permission to pursue the charges. For California sexual harassment victims the only realistic way to receive monetary recovery, or have their sexual harassment lawsuit brought in court is to hire a private sexual harassment attorney. In California most if not all sexual harassment case resolutions occurred because a sexual harassment attorney was hired. On the national level very few of the sexual harassment problems in employment were resolved by the EEOC. While the EEOC provides a forum for resolving a select number of sexual harassment complaints in some states, such as Massachusetts, this is not true in California. It is therefore important to find a sexual harassment law firm who will properly pursue a sexual harassment lawsuit. The right sexual harassment lawyer must believe they can prove the case. They must also feel a wrong was committed. The fight to prove sexual harassment is not always easy. A sexual harassment lawyer must act like a detective looking for inconsistencies in the statement of the sexual harasser, and employees of the employer who investigated the sexual harassment in a negligent manner or failed to take appropriate measures after the victim’s complaint of sexual harassment. The sexual harassment attorney must seek out witnesses while analyzing which witnesses not to bring into the case because they will not help. An experienced sexual harassment attorney might be able to prove the case and prosecute the lawsuit without a lot of assistance from the victim of sexual harassment. An inexperienced sexual harassment lawyer might not be able to. Some sexual harassment victims wish to be involved in each deposition and see how their case unfolds. If the sexual harassment lawsuit cannot be resolved before arbitration or trial the sexual harassment victim’s presence will be needed at these hearings. Experienced sexual harassment lawyers will make it easy for the sexual harassment victim to tell their story while explaining what sexually harassing events transpired and how that effected the victim. The Employment Lawyers Group’s sexual harassment lawyers have represented hundreds of victims of sexual harassment. They have dealt with the worst kind of sexual harassment creating the worst physical and emotional problems for their sexual harassment clients of all sexes, races, and ages. Sexual harassment lawyers will proceed in trying to obtain all potential legal remedies for their clients. These remedies include emotional distress damages, lost wages, potential punitive damage, fines under California Labor Code Section 1102.5, interest, the cost of psychological treatment, and potentially the job termination of the sexual harasser if the employer will agree to that as an item of settlement. To some, the sense of closure is more important than these damages. Many victims of sexual harassment receive tremendous gain by knowing they did not remain silent, they stood up for themselves and others, somebody was willing to believe them and help, and they were able to see the sexual harasser squirm during the confrontation of being formally questioned about their sexually harassing behavior. Still some sexual harassment victims demand that their accuser face a jury, or binding arbitrator who will hold the harasser responsible for their actions. There really are lawyers out there who believe in their clients enough to take their sexual harassment cases without any upfront fees. These lawyers will then spend hundreds of hours of their time and their staff’s time working for the victim of sexual harassment, advancing all court costs while vigorously pursuing the case of sexual harassment. The Employment Lawyers Group is one place you will find these kind of lawyers. 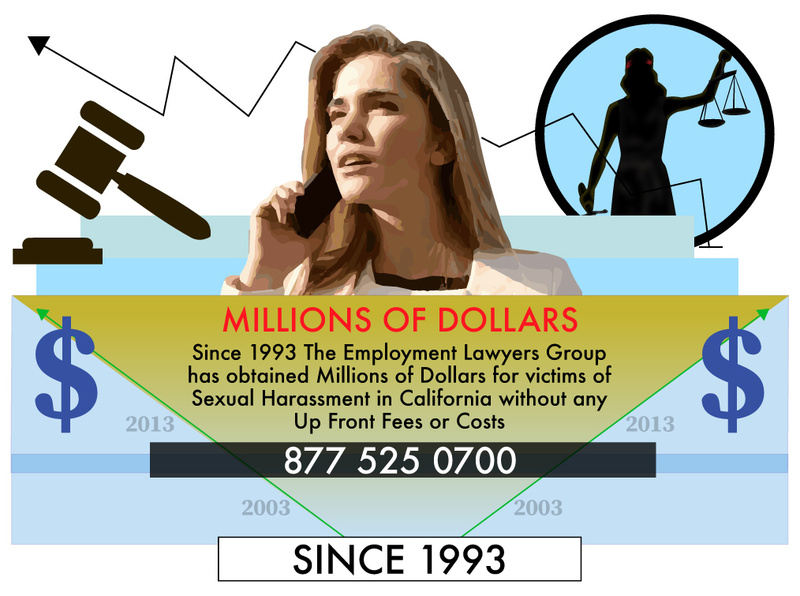 Regularly obtained significant monetary recoveries for victims of sexual harassment. In the last few years the Employment Lawyers Group received the following results for their sexual harassment clients.